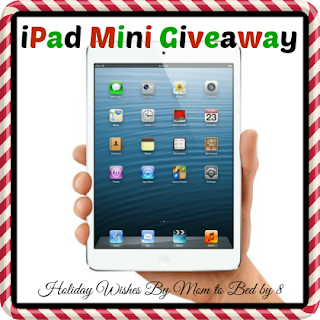 Welcome to the Holiday Wishes by Mom to Bed by 8 Giveaway. The holidays are upon us, and we wanted to bring you an extra special treat! We know the iPad Mini is VERY popular, so we hope you will love this giveaway. Myself, and several other bloggers from the MPM Network, got together to bring you this fantastic giveaway!!! One lucky reader will receive a iPad Mini 16GB! Giveaway ends December 26th at 11:59pm, open to US and Canadian, ages 18+. To enter please use the Rafflecopter form below. Good luck. I have been wanting one of these forever. Kids...I would love to have a tablet for me!!! i would love to win this and give it to my son. he has been wanting one really bad. I need this ipad mini! we could really use one. I need a tablet when I travel, hope to win this. i want to win because we do not have an ipad. thanks! Still hoping Santa brings me an ipad, to help me in my noveling/bookselling ways! I'd like to win because our laptop broke and my hubby and I are stuck using phones to access anything right now. I am trying to find a job and its difficult to search from a phone! Id like to win because I've always wanted a tablet! I bought a kindle for myself that my kids claimed as theirs! So mama needs one just for her. I would love to win this for myself! I have a tablet my my daughter took it over and this would be fab to own! because my kids steal mine!